John Galliano Menswear, Spring 2011A shuffling, bumbling, mustachioed prankster in a too-tight hat and jacket, and too-big pants and shoes – we all know him because Charlie Chaplin’s dandified hobo is part of our visual lexicon. A genius character for sure, but The Little Tramp as fashion icon? Only the talent of John Galliano could make this work. 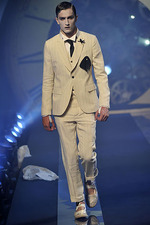 Galliano’s menswear collection runway for spring 2011 was filled with facsimiles of The Tramp, as well as nods to another silent cinema great: Buster Keaton, including his famous porkpie hat. Another influence on the collection was Visconti’s Death in Venice, set around the same time as the silent cinema era. Somehow, the threads of each of these were drawn together in a dandified version of modern menswear. Galliano’s choice to create a collection based on these influences is the most interesting part. In a motif surely borrowed from Chaplin’s final silent film, Modern Times, the models emerged fromthe shadowy gears of a large clock. 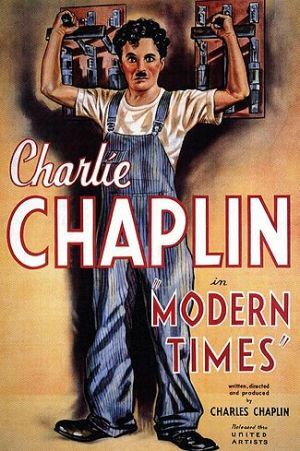 Released in 1936, and known as the final film of Chaplin’s Little Tramp, Modern Times is a timeless commentary on the battle between man and machine. Chaplin never intended his iconic character to transition into “talkies”, so he instead walks off toward an unknown horizon at the very end. Historically, the film marks the end of the silent era and the beginning of modern Hollywood. So why does Galliano seem to think that we’re at the end of an era? Is classic menswear meeting its doom? 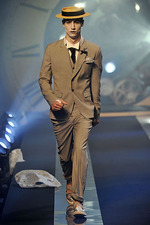 Despite this premonition, or maybe because of it, the designer presented classic suits and sportswear, but with unique quirks throughout. Indeed, the designer claimed he wanted to play with the proportions of menswear, turning the usual notions of fit and tailoring literally upside down. The “old fashioned” cuts were refreshed with an unorthodox mixing of pieces and layers, pulled together by buttons and straps. The Tramp’s baggy pants alternated with slim trousers, either straight to the ankle or cuffed just above it. The palette of greys, deep blues, blacks, creams, and whites was punctuated by a few checks and stripes – reinforcing the look of old film. While these ensembles may not make sense at first glance, Galliano is offering a concise collection of wearable separates that will fit seamlessly into a man’s wardrobe. Once the matinee idol makeup is gone, one sees that the lines are simple and the fit is clean. 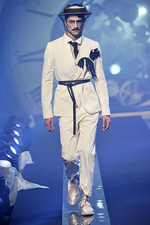 Once again, Galliano's theatricality creates a point, but his design provides the function. So perhaps this show was just an elaborate way of Galliano to move ahead while looking backward? Or is the designer sounding a death knell for menswear as we know it? What do you think? Runway images by Marcio Madeira, Style.com.